“Darkhan Khuns” JSC is the Company established in reorganization in 1993 based on the requirement to operate the food industry of Darkhan city suitable with market economy. It is already about 40 years passed since that time, when the food industry of Darkhan city was constructed by technical and economical supports of Russian Federation and started its utilization on 18 February 1971. 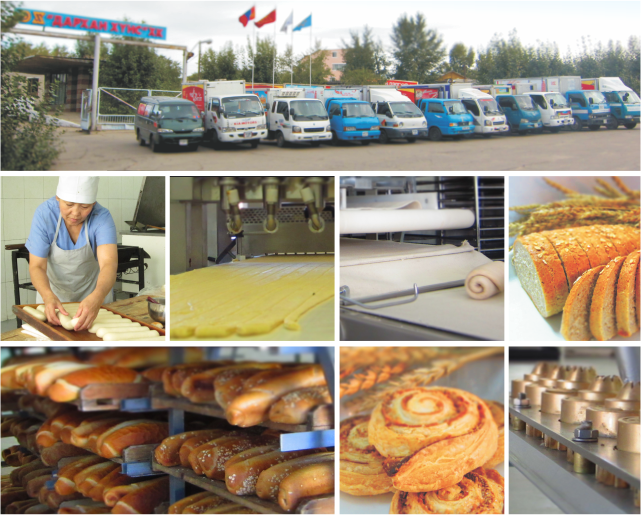 This industry was opened as a complex with the main purpose to provide citizens in Darkhan city by various kinds of food products and currently it includes workshops of bread, pastry, candies and milk, auto farming and machine shop. “Darkhan Khuns” JSC has the superiority such as rich production techniques, technologies, facilities and well experienced professional employees and 40% of its all employees are the experienced employees who are already worked for 20-30 years and well-known by the local area residents. As the year of 2012, production and sales of our Company increased by 30.2% than the previous year and solely providing the 70 percent of the local area market after improving its products’ technology, quality, image and packages. 6 kinds of milk and dairy foods and 7 kinds of “Tsaskhan (snow)” brand ice creams from cow fresh milk are being produced by the equipment and technologies imported from Japan and China. 7 kinds of breads and new brand of “French bread” by the equipment and technology imported from France. “Italy” brand luxury class pastry and 35 kinds of food products are being produced by the equipment and technology imported from Italy.